In 2016, membership supported the Animal Cruelty Task Force (ACT) by raising more than $115,000! In 2017, WLC members have selected to support HSMO's Shelter Veterinarians. These specialized veterinarians provide care for our rescued pets through disease prevention and medical rehabilitation, as well as emergency triage for the animal victims of hoarders, substandard breeding operations and disaster situations. Veterinarians also provide animal forensics, evidence, and expert testimony vital to animal abuse investigations. 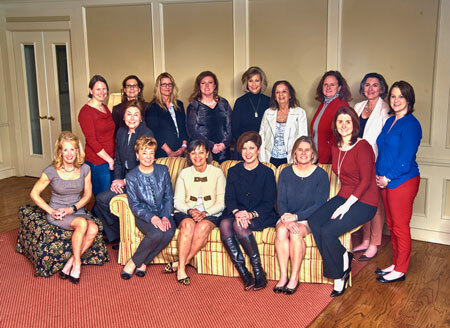 Enjoy opportunities to network with other HSMO Women's Leadership Council members while helping provide a safe and caring haven to abused, neglected and abandoned animals. 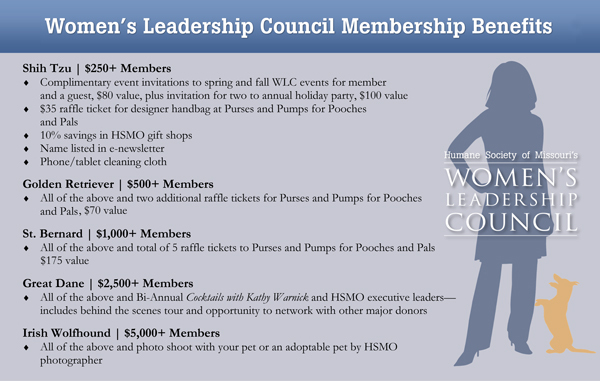 Receive invitations to select Women's Leadership Events such as Purses for Pooches, specially tailored HSMO seminars and more! Receive recognition in Tails, the Humane Society's quarterly magazine. Network, learn & help animals with the Women's Leadership Council ! March 29 - Sneak Peek! Golden Retreiver members and above can enjoy an exclusive open house at HSMO's NEW Best Buddy Center in Maryland Heights. April 5 - Tory Burch shopping event: receive a 10% discount, and the WLC also receives 10% of proceeds. 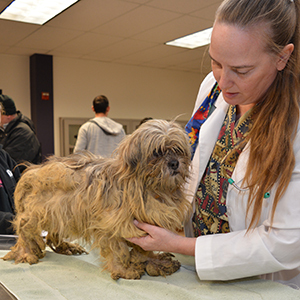 May 3- Animal Cruelty Task Force Investigator Carmen Skelly and AMCMA veterinarian Julie Brinker talk about their rescue and animal forensics careers. Contact Stephanie Prewitt at sprewitt@hsmo.org or 314.951.1508.